September 28, 2015  President Obama and Russian President Vladimir Putin met Monday after both spoke at the United Nations General Assembly. The two have been at odds over a solution to the Syrian conflict. September 28, 2015  President Obama vowed to work with Russia and Iran to resolve the Syrian conflict at the United Nations General Assembly Monday, but he insisted there's no place for Bashar al-Assad. Amid Tensions, Obama And Putin To Meet At The U.N.
September 28, 2015  President Obama meets Russian President Vladimir Putin on the sidelines of the United Nations General Assembly on Monday. The meeting comes as Russia has been more assertive in the Middle East. September 25, 2015  President Obama called House Speaker John Boehner a "good man" and reflected on what his resignation says about the political climate in Washington. 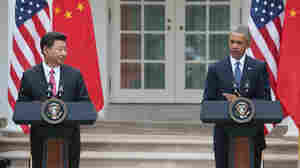 Obama's remarks came during a news conference with China's president. September 25, 2015  The proposal includes a nationwide cap-and-trade system beginning in 2017. China and the United States are the No. 1 and No. 2 emitters of heat-trapping carbon pollution. September 25, 2015  A look at the economic backdrop to today's summit meeting between President Obama and Chinese President Xi Jinping. September 24, 2015  The White House confirmed Thursday that President Obama will meet next week with Russian President Vladimir Putin on the sidelines of a United Nations gathering in New York. The one-on-one meeting marks an end to U.S. efforts to isolate Russia over its military maneuvers in eastern Ukraine. September 23, 2015  President Obama welcomed the pope to the White House Wednesday. The two men have a shared interest in addressing climate change and income inequality, though they disagree on issues such as abortion. September 23, 2015  On a beautiful sunny day, in front of a massive crowd, President Obama greeted Pope Francis at the White House. For more details, Renee Montagne speaks with NPR's Scott Horsley at the White House. September 22, 2015  Pope Francis was greeted upon his arrival by President Obama and Vice President Biden at Joint Base Andrews near Washington, D.C. He will also travel to New York City and Philadelphia on this tour. 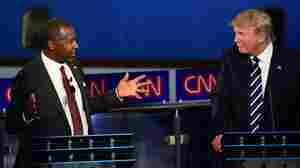 September 17, 2015  Republican presidential candidates debated a number of issues last night in California. Some of their claims didn't quite hold up under scrutiny. September 9, 2015  Republican presidential candidate Jeb Bush unveiled his tax plan Wednesday, calling for deep cuts in both personal and corporate taxes. It also proposes limits on many popular tax deductions. 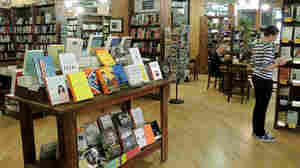 September 9, 2015  Known for its vast selection and knowledgeable sales staff, it's a Denver institution. Now, after 40 years, the store's longtime owner is making preparations to pass the reins to a new generation. September 3, 2015  Focusing on long-acting contraception, such as IUDs and hormonal implants, proved to be a big success in reducing unplanned pregnancies and abortions. But political backing has been hard to come by.